“People Helping People” is about results. Here are a few testimonials of what our recent patients and providers had to say about our emergency medical services. Please Note: Names & identifying factors may be missing from the following testimonials in an effort to respect patient and provider privacy. Thank you and all BestCare personnel for the excellent service you have always provided for us. Through out our many years of association with your company, the U.T.M.D Anderson Cancer Center Case Management Department has come to depend upon ‘s expedient and efficient service in the care of our patients. BestCare EMS (BCEMS) has provided contract ambulance services for the Harris County Hospital District for almost 9 years. During this time, BestCare has gone above and provided excellent services to meet the needs of our patients during routine ambulance transports, wheelchair, and emergency transports between facilities. 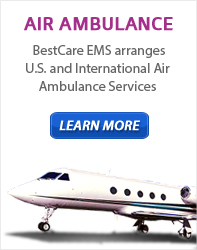 Call our offices at (800) 868-3588 for more information or Request an Online Quote to schedule your Medical Transport.